In which music is dangerous and confusing, Jamie Madrox has a weakness for femmes fatale, the term “f-holes” makes Miles turn 12, and we bid a fond farewell to Larry Stroman. NEXT EPISODE: Mikhail Rasputin ruins everything. On the “speedsters learning things quickly” bit: I can’t speak to other Marvel characters, but it’s a long-standing rule of DC’s Speed Force-empowered characters that any skill or information they learn from reading or practicing at super speed will basically fall out of their heads after an hour. Bart “Impulse/Kid Flash II” Allen had the unique quirk of being able to remember things he’d read at speed but it was never applied to anything other than reading and he’s been retconned out anyway. I can’t speak to Marvel speedsters other than Pietro, or non-Speed Force DC characters like Superman (though I’m ninety percent sure I’ve read every post-Crisis appearance of Captain “Shazam” Marvel and he never did anything like that either). And Peter David definitely wrote Rick and Marlo’s wedding. The sound of a cannon firing would seem appropriate. Pre-Crisis Superman could do this, and as such was pretty much a super know-it-all, with unofficial and official degrees in pretty much everything. He was amongst, other things, an engineer, proficient in numerous sciences and was also a literal brain surgeon. As an example for the Flash- he once basically read everything on bridge making, fixed a bridge, then forgot how to do that, all in the span of minutes as he sprinted around. Post Crisis Superman has demonstrated he retains information he gains at super speed as well. His brain started processing stuff at a much faster rate post Infinite Crisis. maybe something about him not being speed force powered? Yes, pretty much that. Superman’s power isn’t super-speed from the speed force so much as he’s a Kryptonian, with all that that entails. The thing about learning things super fast is that you’d presumably also forget things super fast. So if Quicksilver didn’t play piano for a week, it’d be gone in the same way it’d be gone for a regular human after ten years of not playing. Actually we know from the psychiatry episode that Quicksilver is always super fast even when he’s not moving. So live must be an absolute hell. He’s lived tens of thousands of years worth of experience by now. Imagine if he was waiting for his favourite show to come out on Netflix. Everything he anticipates would be like the last Song of Ice and Fire book is to fans. All the tedium troubles of the immortality thought experiment, but with everything crawling by instead of flitting past ever more quickly. It must be awful. IIRC It’s been mentioned that the insta-teaching of foreign languages (and other info dumps) that Xavier can telepathically implant in the X-Men’s brains is very short lived, which explains why they can forget how to speak languages they’ve previously been mind-zapped with knowledge of. Coming up soon in an X-Factor epiosde will be his session with Doc Samson where Pietro outlines the sheer misery that is his life, it’s one of my favourite scenes with him, ever. See also an old issue of Innovation comics “Hero Alliance”, where a civilian has the power or superspeed perception and, but his body is entirely normal speed, so he can read at superspeed, but can’t turn pages any faster than you or eye (this was pre-Kindle), you could throw a handful of coins in the air, and he’d be able to count them individually, but he wouldn’t be able to catch them. A fascinating examination of an unwanted power he couldn’t think of a [ractical use for. I read an Australian comic with a character like that, with super speed perception but a normal speed body. Southern Squadron? Something like that. It didn’t last long. But anyway, the guy had this helmet with a camera that whizzed around, giving him 360 degree vision, just so he didn’t fall asleep through lack of stimulation. 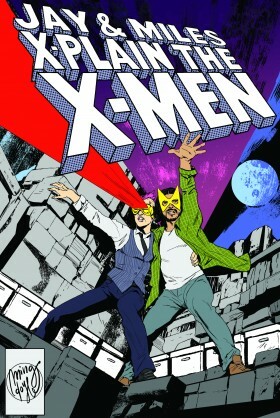 Please get Kieron Gillen on to talk about his past runs on X-Men. I’m gonna No Prize that string instrument: ostensibly, there may be different types of instruments in the MCU due to interactions with larger varieties of cultures with their own instruments and tech. This is a thing that resembles a lot of earthly string instruments, but either has Atlantian or Nova Roman or something else origins. I have my own multiversal question: how does it work with characters that jump between timelines. In other words, the Nathan Summers originated in 616, grew up in 4935, and returned to 616 for our Cable. What about the Cable from another timeline? Did he originate in 616, grow up in 4935, and then return to anotehr earth via a Cable Split for that timeline (this is more the question where the split occurs well BEFORE Cable appears, rather than after when we can just consider it splintered from 616)? Or are there a bunch of bad Cable futures he grows up in for all the different timelines? So Guido knows her through Val’s brother. That being Agent Dale Cooper from Twin Peaks. Who is played by Kyle MacLachlan. He(Kyle) would know Sean because she played his lover interest in his first major motion picture, Dune. So in the 616, did Agent Cooper star in the famous box office bomb, but secretly kinda awesome movie, Dune? Or do Dale Cooper and Kyle MacLachlan know each other? Or did Sean Young make friends with Dale and remark on how much he looks like her former costar? I’m so confused! Easily my favorite in-universe explaination for contradictory continuity. I suggest that beefiness be measured in Ferdinands, on a scale of -10 to 10. So, for instance, I was about -5 ferd in high school, but later, after I had been delivering beer kegs for a while, I got up to about 2 ferd. -10 ferd would be essentially insubstantial, like the Ghost who’s always trying to break into Tony Stark’s armor vault. 10 ferd would be a literal Minotaur. As someone who is a perpetual -2 Ferd, even at his most athletic, my skinny arms approve this. Also, Ferdinand is the best. I’ll defend the honor of NOT ANOTHER TEEN MOVIE; it’s honestly good and funny (and raunchy, if that’s your thing). The bad films you’re thinking of are the Friedberg/Seltzer DATE MOVIE/ EPIC MOVIE/ MEET THE SPARTANS flicks that more or less just reference something and act like doing that is funny. Yes. A surprisingly good movie that probably would have done much better if they had given it a title that didn’t seem link it to that other franchise.